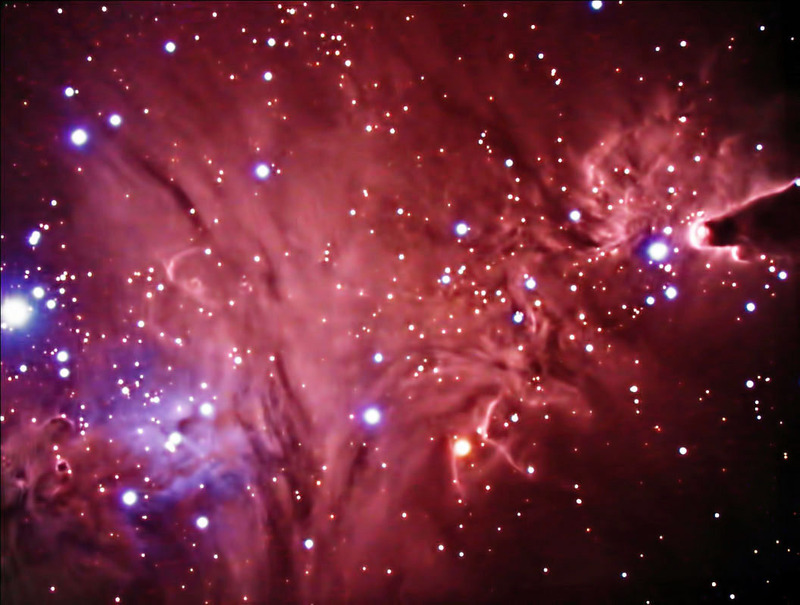 NGC 2264 actually includes two identifiable objects: the Christmas Tree Cluster and the Cone Nebula. The Christmas Tree Cluster fills the entire frame. The "trunk" is the bright variable star to the left, S-Monceroits. The Cone Nebula is on the opposite side. This is a large star-forming region (particularly noticeable on the tip of the Cone Nebula) that lies approximately 26 thousand light years away. Also partially visible in the lower left corner is the Fox Fur Nebula. Its shape is due to the stellar winds created by nearby stars. Expoures: Color: 9 @ 5 min. Ha: 14 @ 10 min. Processing: Color mages were focused using the camera's live view. Subframes were reduced, aligned, and combined in ImagesPlus. Ha images were captured, aligned, and combine in CCDSoft. The color and Ha images were aligned in RegiStar and combined in Photoshop. The composite image was adjusted in Photoshop CS2. DeNoise was applied to reduce noise.